Weather +4c - +9c later. After Sundays poor result myself and Dean are fishing again today but decide on a leisurely start, with a nice cooked breakfast on the way. I collect Dean around 7am and we are soon in the cafe devouring a full English each. With the temp much milder today after 3 days of freezing temperatures overnight, prospects look good. The boat looks much happier without its white frost covered top and the gear is soon loaded and we are off. As its only a fairly short session today we decide to only venture as far as the outfall at Postwick. This journey is literally 5 minutes from the mooring. We are soon set up with one live and one dead bait on two rods each. 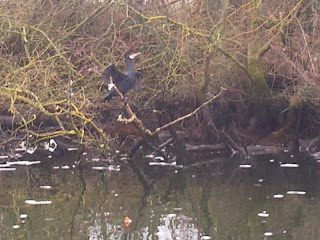 Positioning the dead baits just off the flow and searching round with roving live baits. The weather could not be more different than Sunday with a nice overcast sky but already around +8c. Again Dean is the first one in. His live Roach is taken after 45 minutes. This fish gives him a really good scrap and its no surprise when i slip the net under it looks like a "Double" . The scales confirm the fish as 12lb 13oz which is a new PB for Dean. Unfortunately the camera is refusing to work so its slipped back straight away. After its returned we realised we could have used the phones camera but its too late. With such a good start we both look forward to the next few hours. Unfortunately as with any fishing, the plan does not always come off. We try everything we can to attract another take but nothing. Just as a change of scenery we decide to move downstream in an area to be know after today as, Cormorant Bay. We are positioned and fishing within 10 mins but again, its very slow. I finally get a few "Twitches" on my dead bait float, but nothing develops. I reel in to check the bait bit its un marked. I replace it in the same spot and 15 minutes later the same thing happens. Very strange but gets us on our toes expecting at take at any time. Dean then gets a proper running take on his live bait but misses that too. With time running out, my float again quivers and jerks on the surface.I pick up the rod in anticipation but instead of the float sailing off, there is a massive swirl next to it and a full grown Cormorant surfaces with a Bream of about One pound clamped in its beak ! With one big gulp,its gone and the bird dives under again. A few seconds later it surfaces 25 meters from us, climbs out onto a branch and settles down to digest the meal its just had. Its sitting no more than 2 mtrs from Deans float ! After about 5 minutes we cant believe what we see next. The Cormorant dives back in and within 10 seconds surfaces again with another Bream, this one slightly bigger, and gulps that down too. Thats about Two and a half pounds of Bream in 5 minutes. At this rate there may well be a fish shortage on the broads in the near future. 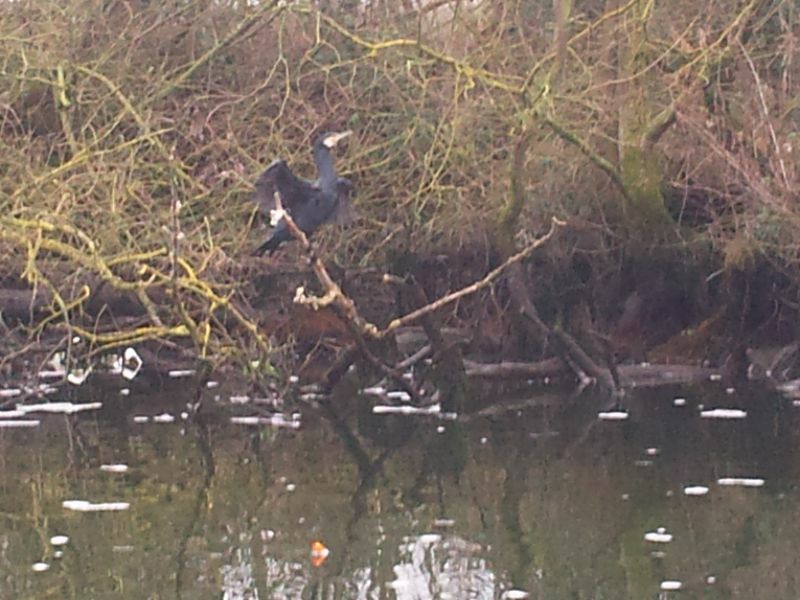 Several other Cormorants can be seen "Roosting" all along the river. We decide to pack up half an hour early and head back to the mooring. Although ive had my second blank in a row, im still happy with my recent "20" and wouldn't really mind if i didn't catch another Pike this season.